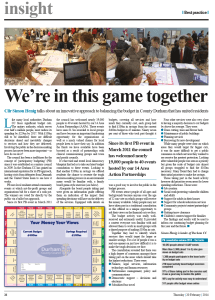 Municipal Journal featured Durham County Council’s exciting work on Participatory Budgeting in its February 20th 2014 issue, highlighting the 19,000 residents who have directly participated in deciding on how to spend over £1.5m on local projects. Since its first PB event in March 2011 the council has hosted 40 events across it’s 14 Area Action Partnerships (AAPs). These have become an important fundraising opportunity for the organisations as well as a much valued chance for local people keen to have their say. In addition the funds have been boosted as a result of partnerships with clinical commissioning groups and town and parish councils. Durham also used these events to inform and consult on the difficult decisions facing the council as it looks to make a further £100m of cuts to its budget in coming years through an engaging board game, played by over 3000 people during the last round of participatory budgeting. The council has been a trailblazer for the concept of participatory budgeting since it was established as a unitary council in 2009. In fact Durham CC has gained an international reputation for its PB approach, hosting visits from delegates from Denmark and the United States keen to see how it works.